Dear Instagram, I know you listen to my conversations and feed me ads accordingly. I can even tell that you’re having Google read my emails and feed me ads that fit into that. 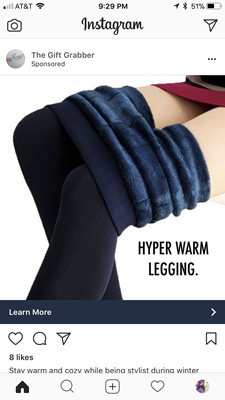 But whatever you read or heard that made you think I am the type of person to buy leggings based on how they look when I sit on the toilet – that was bad information. Very bad. 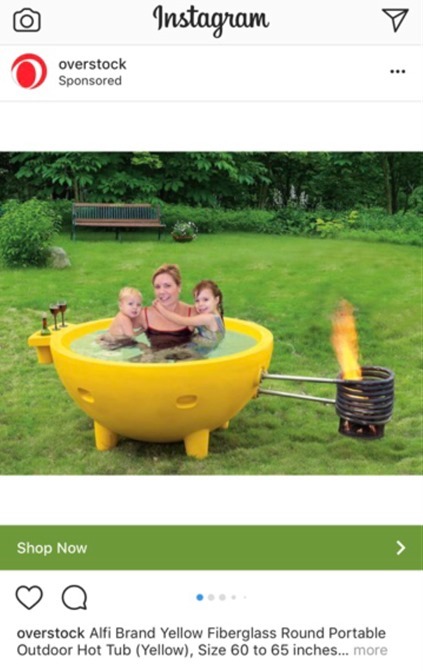 And also – I’ve never – not once – emailed or discussed boiling my family for a delicious Spring Stew. The wine glasses are a nice touch. Stew is always better when steeped in wine. But why are there two wine glasses and a beer bottle for one mother and two small children? If in fact this isn’t just a slow cooker advertisement? 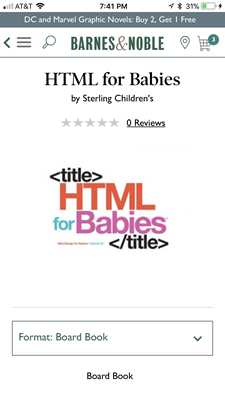 I don’t know which is more offensive – the fact that Barnes and Noble wants my baby to get to coding, or that Amazon thinks I care about my Cat’s IQ. And also I’m pretty sure all cat’s IQs are high enough to fake the test altogether so good luck getting the accurate number you so desire. 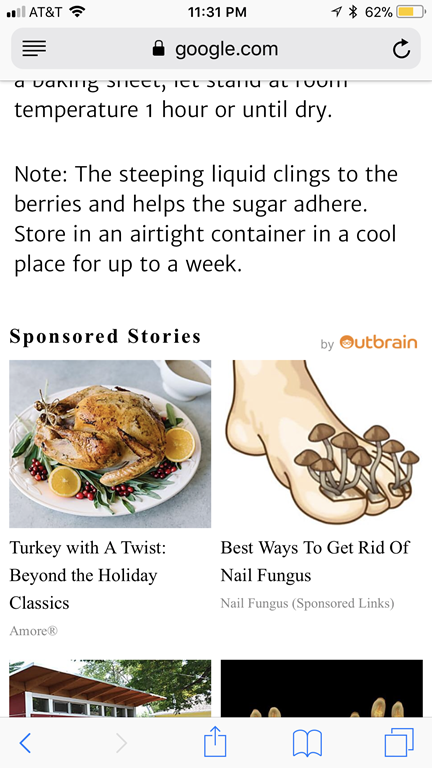 And there’s nothing quite like looking up a recipe and getting an ad for toe mushrooms underneath it. But let’s move onto other sightings. I spotted this reusable bag the other day, if someone forgot to bring one. Noah’s school books are constantly testing my ability to keep my serious teacher face on and not laugh like a Junior High boy. I’m pretty sure it’s planned that way to test my holiness. And then there’s Fran and her impressively sized..wishes. 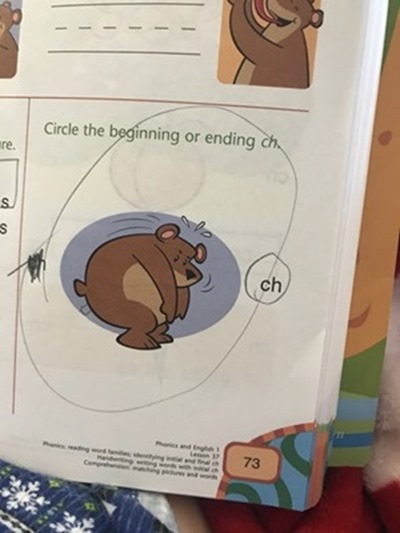 Can we please leave the bear fat-shaming out of the first grade? Noah never catches the same things I do. But this time, he had his own conclusions of what they were going for. He added a tiny protrusion to the drawing, then informed me that the page was wrong because “pooping” doesn’t begin or end with the ch blend. I get it, Noah. I get it. 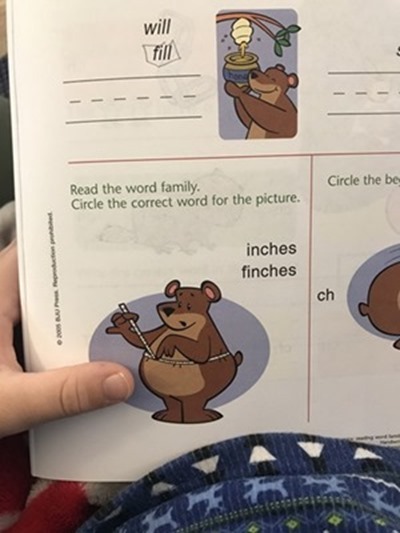 What kid would assume that bear was supposed to represent crouch. And finally, we have an issue of local politics we need to discuss. I don’t know why I follow the city council on Instagram, but I do. And because of this, I now do indeed know. Now. 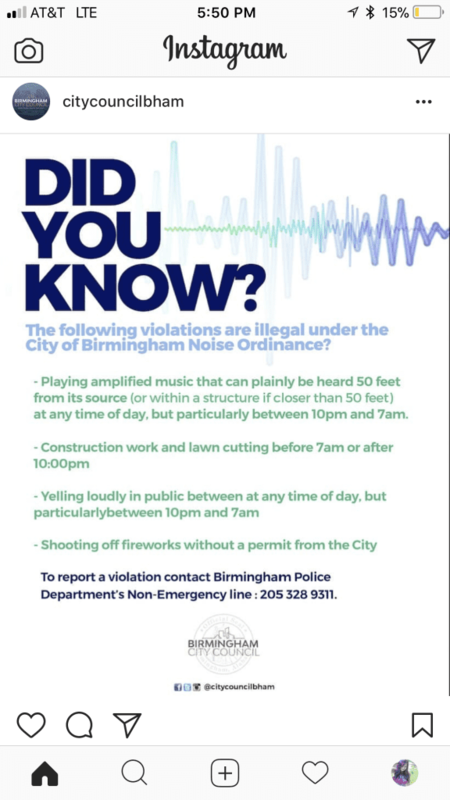 I’m as much against loud noises as the next guy. Probs way more. But what happened to living in a free country? 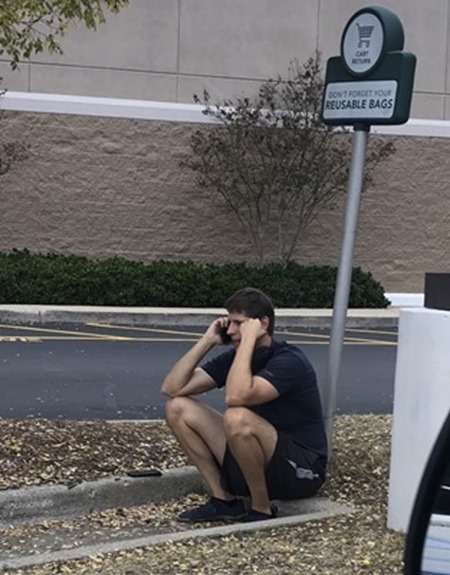 And if I see that you’re about to get run over by a car, can I get a one-time permit to be able to yell loudly at you? And where would I obtain said permit? Because if it’s at the DMV, you’re definitely dead. But I will say that this revelation definitely brightened up our family downtown walk on Saturday. Next Post The Laundry Basket From Above. Previous Post Your Personal Shopper In Waiting. CROUCHING! The bear was crouching!! That was a tough one. Especially after watching him TIE A MEASURING TAPE around his middle. (what the heck, bear, you’re not over weight, no matter what your publisher tells you). Why you? It’s so you can entertain us! 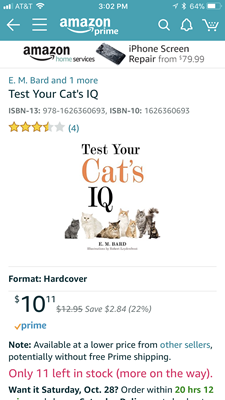 And I LOVE that there are only 11 copies left of “Test your cat’s IQ”! I wonder how many they started with. And who’s bought them. I’m going to go read reviews now! Ha!! I bet they are PRICELESS. I agree with Noah. There is no word that starts or ends with “ch” that describes that picture. I also just want to thank you for this blog. 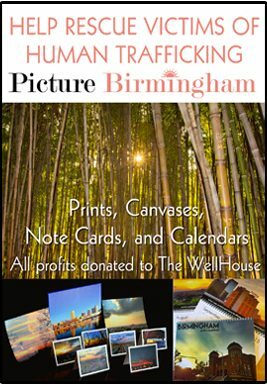 I read very few blogs any more, but when your posts come up, I always check them. 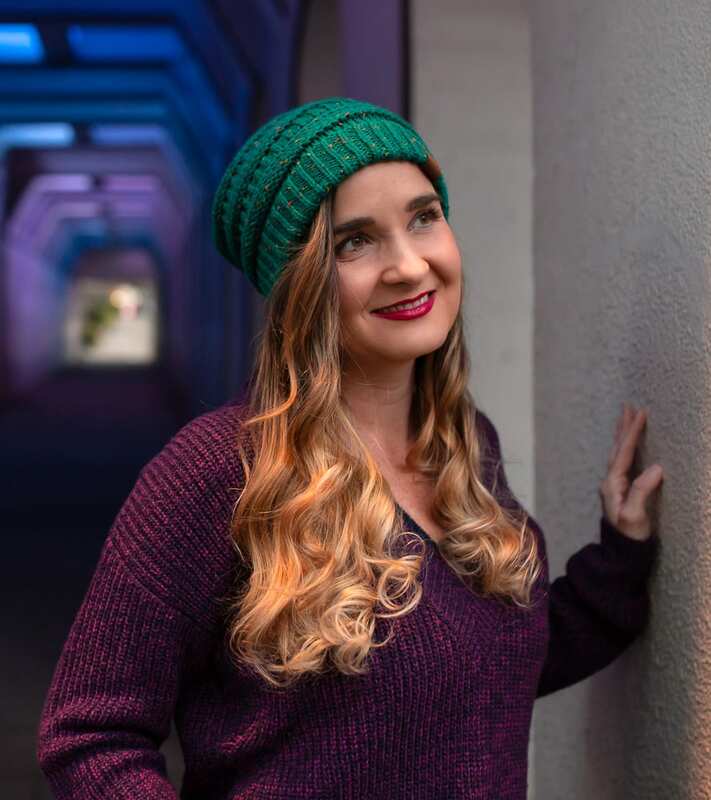 In a very stressful world, you are a moment of laughter and smiles. I appreciate that very much and I am grateful that you chose to use your talent for humor to help make this stressful world a little better. Thank you so so much!! I was just telling someone last night that I often feel like my blog is a sitcom that’s gone on two seasons too long. I’m so glad to know there are people out there that still glean some value out of it!! I thought the bear was doing crunches. Because he is fat, I guess. 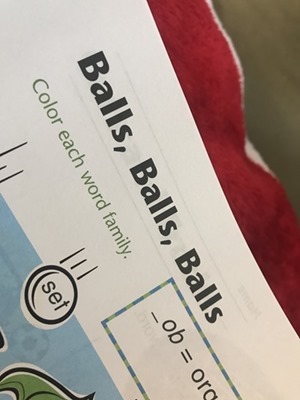 In the vocabulary book I have been using for my 10 year old (what is a grade?) I found a section that tried to define ”supporting a view” as simply restating the view more vehemently. This launched me into a 30 minute rant against that crap, proper defining of view, argument, and support, and a rewrite of the answers. I hope he learned something. I would have preferred a pooping bear. It occurred to me that the bear should have been wearing those leggings, after all, it’s cold in the woods.